Question the second: if I were to write an article (say, for ) about working with vintage patterns, what kinds of questions would you want to have answered in it? Holly (of ) is having a holiday sale — 20% off anything site wide! Use the coupon code HOLLYDAZE; sale runs through the end of the day Monday. Books: Sewing books are always a good idea, and you really can't have too many. There's always more than one way to accomplish any given task or technique, and the more sewing instruction you read, the better the odds of you finding the way that 'clicks' with you. It's called, in full, and it's really a lovely book. Clear, well-illustrated, and helpful, with a range of projects from the very simple (envelope-back pillow) to the more elaborate (handbag with pockets, circle skirt). And it's not quite in the "books" category, but either a subscription to , or, if you're feeling really Santa-like, the new . Fabric: It is a truth universally acknowledged that a sewist in possession of some fabric is always in want of MORE fabric. However, if you don't sew, buying fabric for someone else can be a bit tricky. What do you buy? How much do you buy? I think you can never go wrong with high-quality natural fibers (or, of course, ). My advice? Either buy four yards of something gorgeous, or try a gift certificate to one of the . Notions: Go. Nuts. Seriously. Wander into a chain sewing store and hit the notions aisle with a basket and an open mind. Don't know what a is? Dump it in the basket. Throw in whatever little tools or gadgets or thingamagigs take your fancy, put them all in a nice covered basket, and call it a day. If your recipient already has one of whatever it is you picked up, she could probably use another, newer, sharper one, and if she doesn't, she'll have fun figuring out how to use it. Wandering in a store is more fun, but if you don't know where to go (or, cough, have ridiculous problems with going to a "girly store"), try or online or even . Patterns: This, surprisingly, is less fraught than buying fabric, IF you already feel confident when buying clothes for the same person. You just choose a pattern that looks like something your recipient would wear, IN THE RIGHT SIZE. Remember, pattern sizing is different from "normal" sizing, so go by measurements and not the size number. A better strategy is to get a in an approximate size (or even a couple of patterns) so that you have some redundancy in the system. Bonus points for saying "These were so beautiful, they reminded me of you," when you give them. Do you sew and have a gift wishlist of your own? Leave a comment! ONE-LINE STORY: Sometimes Samantha just didn't understand modern art. There is NOTHING about this pattern that I don't love … and it's available from Jen at , and it's 20% off today through November 30, 2009! Just use coupon code 'toomuchturkey' when you check out. ONE-LINE STORY: Amanda hoped that no one would realize that she was actually a blow-up doll. This pattern is also on sale, from Sheila at Out of the Ashes: 15% all orders, through Sunday night — use the coupon code "TURKEY" at checkout! It's being listed by my friend JZ, who posed it on my dressform (set to its daintiest size!) in my garage. So I saw this in person, and if it had been my size or any reasonable approximation thereof, I would have bought it on the spot. So if you're on the teeny side, you should REALLY check this out! No, no, I'm totally kidding you. 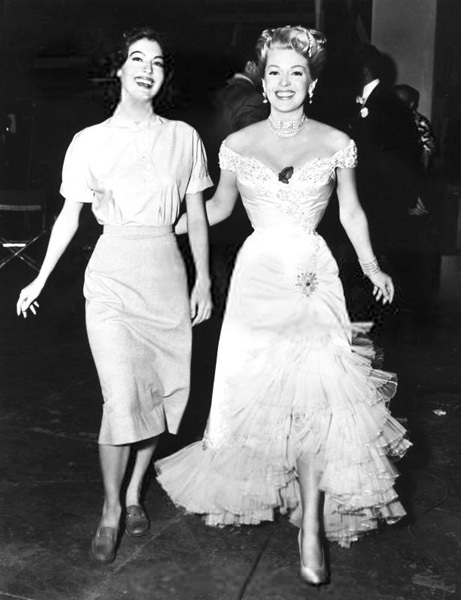 She wants Lana Turner's dress. What I want to know is what kind of event accommodated both outfits … Ava's dressed for a day at the office where she may just have to move some file boxes, and Lana is dressed for, well, a wedding. Possibly a wedding in an Old West Saloon, where high kicks may or may not be involved. 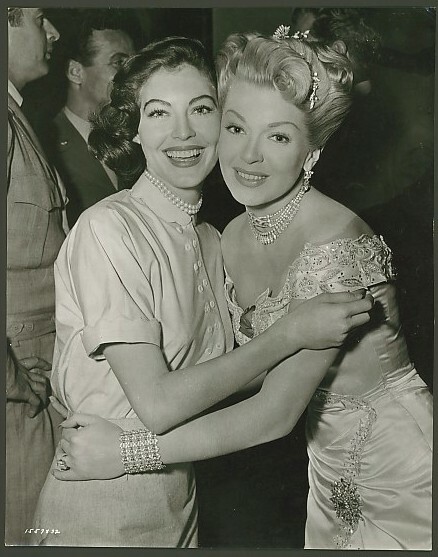 I know nothing about Lana Turner and only slightly more about Ava Gardner, so I am relying on you film buffs to enlighten me. And in the top picture, there's a guy in what looks like white tie, and in the bottom there's a guy in what looks like an Eisenhower jacket. Go figure. Blue: C'mon, first hit's free. Red: That's what you said last time. The rest of the story writes itself, although you're welcome to write more of it in the comments. Bonus points for using: "mother's little helper," "get clean," and "riding the dragon." Other scenarios: ticket scalping; invitation to secret society; numbers-running. What do you think is the most plausible? Pattern courtesy (get it? de-stash?) on Etsy. Carolyn's de-stash is your re-stash, or something like that. If you've spent any time on the at all, you've met Birgit (she uses the name there). Birgit has made more than FORTY THOUSAND wiki edits, and is one of the main helpful elves who help maintain the wiki, keep it neat and tidy, and hold the hands of those who need help—and boy, do I appreciate it! How did you get involved in the pattern wiki? One fortuitous day in early December of 2007, I read on your blog that a wiki for Vintage Sewing Patterns had been established. Finally, my hoarding of pattern pictures already sold was given a justification! I promptly proceeded to upload them, and start scannning in all the others, and have not stopped ever since. I format, add categories and descriptions, clean up redundant categories, track down listing duplicates, typos and broken or expired links – almost every day. What do you like to do best in the pattern wiki? I absolutely love doing a random search, and happening upon a treasure I had never seen before. It is a bittersweet thing, as most of them are not (immediately – hope springs eternal) available. Another delight is seeing what new pattern images have been uploaded, as well as discovering that one of the elusive wished-for patterns had a new vendor listing added. Seeing a picture of someone's finished work is the ultimate, though. Generally, the idea of preserving the history of these patterns, making them approachable, searchable, and link to the ones you can buy is what I love about the wiki, and with over 22,000 pattern pages now up it is becoming more useful every day. I have even been contacted by magazine writers who were looking for a high resolution image for the article, based on their search of the wiki. Do you have any favorite pages? There are too many patterns to list – I am a serious addict – but when it comes to the special pages, is among my favorites as a quick gallery of new additions. The category pages also stand out. How would you encourage other folks to get involved? Just start by browsing around; get familiar with the Search feature (what it does and does not bring up) and with the general formats and the proper date ranges (no later than 1985). Then, get to uploading. If you have questions, ask one of the frequent contributors by going to the Community tab on the left, or use the forums. If you make mistakes, don't worry – most are completely and easily fixable. And please, pretty please, upload pictures of your finished vintage creations. There are far too few (check out the Gallery Photos category). At least, add a link to your other online postings such as blogs, picture galleries and reviews. , our busy admin, is doing an incredible job of hunting these down and linking them, but certainly, there must be more of you out there actually sewing and creating! Are you active in any other wikis? Um … no. I certainly hope nothing else I am seriously interested in comes around – housework and other necessities would end up completely neglected. Birgit also runs the pattern store at Main Street Mall Online — the pattern at the top of this post is from her store, isn't it gorgeous? I also love this and this . Sooo pretty.